Lots of people do not have dental insurance. Some employers include it as part of health plans, but many do not. Sometimes even when patients have dental insurance, it doesn’t meet all their families’ needs. According to the National Association of Dental Plans, about 23 percent of the population in the United States does not have affordable dental insurance. At Shorewood Family Dental Care, we want to make sure everyone has access to proper and affordable dental care. That’s why we offer an alternative: the My Smile Dental Program; an affordable in-house savings plan option. The Shorewood My Smile Dental Program is not an insurance program and cannot be used in conjunction with dental insurance. Rather, it is a savings program that covers recommended dental exams, cleanings and treatments. It also offers a 20 percent discount off a number of other services if needed. You are also eligible for 20 percent off additional cleanings, sealants, CT scans, fillings, root canals, crowns, core buildups, veneers, periodontics, laser treatment, dentures, partials, implants and specialty services. A consistent schedule of dental check-ups is an essential part of your families’ overall health care. During the exams, your dentist and hygienists assess your oral health and look for changes since the last visit. In addition to checking for cavities, you’ll get a careful examination of your tongue, throat, face, head and neck to look for any signs of trouble. Regular cleanings are also important to remove plaque and tartar buildup. If not removed, plaque and tartar can lead to oral diseases. By staying on top of your oral health, there is a better chance to prevent issues or detect abnormalities before they are too far advanced. See why we are the best dentist in the Shorewood, Illinois area. 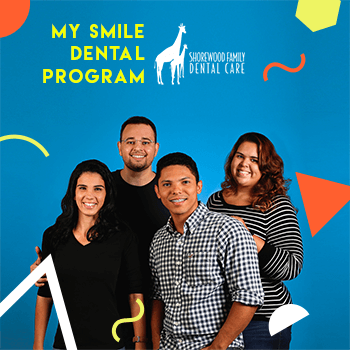 Learn more about the affordable dental Shorewood My Smile Dental Program. You’ll find pricing information and easy sign-up options.